The Beth Chatto Gardens began in 1960 when the site was an overgrown wasteland between two farms. Faced with all kinds of difficult conditions Beth and Andrew Chatto set out to find homes for many of the plants they wished to grow. With dry and damp soil in both sun and shade, they were able put into practice the underlying principles of what is now referred to as "Ecological gardening". 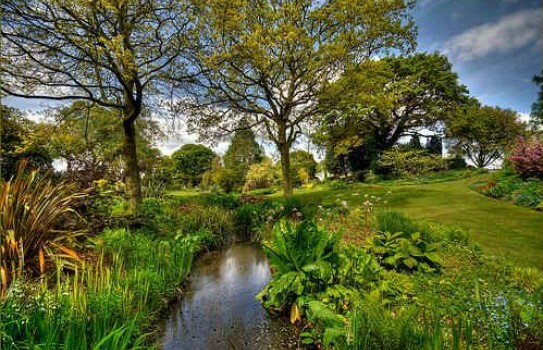 There is a series of 4 gardens - Scree, Gravel, Woodland and Water all with lush leafy plantings of Gunnera, Eupatorium, Phormium and impressive Miscanthus around a series of natural ponds. Beth Chatto Gardens - a great visit. 2019 - Beth Chatto Garden - Please see website for days and times. Tearoom, disabled access, plant sales. If you want to take a break near Beth Chatto Garden, why not stay in one of our recommended hotels. Each hotel has genuine guest reviews enabling you to book from anywhere in the world in total confidence. Look now for places to stay near Beth Chatto Garden - click here.